WASD/Arrows to move and turn player. Space to jump forward. 1/2/3 to change cameras. R to grab/release an object and to toggle switches. Q/E to rotate held object. 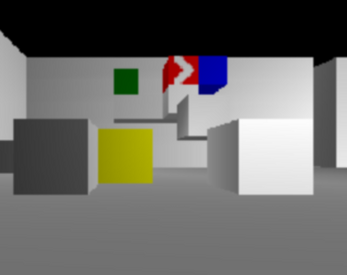 A level for a grid-based puzzle prototype incorporating several finished mechanics including: multiple cameras, object carrying with in-hand rotation, toggle switches, and simple physics. The goal of the level is to press the green button atop the large staircase.